The final day of the Rolly’s Brownies National Championship greeted the now swollen fleet of 69 Moths, as a few more joined in for the weekend racing. But first thing Sunday there was a huge bank of sea mist over Portland harbour and a few were concerned that once again the Moth Nationals would be cut short. Nonetheless, the race officer headed out to the race course and after a brief delay the mist started to clear and the fleet was called out to the Race course. Race 10 got away cleanly but with a sub-foiling breeze many boats got stuck low riding down the race track. The key thing was to avoid the large hole on the course something that Peter Barton revels in. This meant that by the windward mark and through Peter banging the extreme left, he had a 200m lead on the fleet, but it’s hard work these days to stay in front and by the end of the race Chris Rashley had come through to take the win. But the question was how had overall leader Rob Greenhalgh faired? In fact - no problem, he had escaped any issues on the course and took second followed by Mike Lennon in third and Ben Paton fourth. By race 11 the breeze had built a bit and a good start was now the key. By this time there were many battles going on across the fleet as you could see everyone was trying to catch the person in front of them. On this occasion Rob Greenhalgh was not going to let the event championship drag on any longer than necessary and took the win with Chris Rashley second and Mike Lennon third and Simon Hiscocks 4th. Rob had done enough by this point to claim the National championship title with a race to spare and headed for the showers. For Race 12 the breeze was back up to 12 knots and the sun had once again come out to say goodbye to the Moth fleet. By this time there were some tired legs out there but this did not stop the 63 finishers of the final race. The final race win was taken by Simon Hiscocks followed by Chris Rashley 2nd and Mike Lennon 3rd, Paul Goodison 4th. The fleet then headed ashore most with big smiles on their faces. To sum things up this was the biggest Moth Nationals in the UK and Castle Cove Sailing Club did it justice with a fantastic race team and very competent rescue crew in some testing conditions. Even the weather played ball with mixed wind conditions across the 12 races but every day the sun came out. This venue will now be named Weyibiza. The UK Moth Class Association would like to thank all the event sponsors for their support – Azure Logo Embroidery, Shock Sailing, Blueteq, Palmers Brewery and the Acqua Beach Hotel with a special thanks goes to Helen Rollinson of Rolly’s Brownies for all her hard work and sponsoring the event. 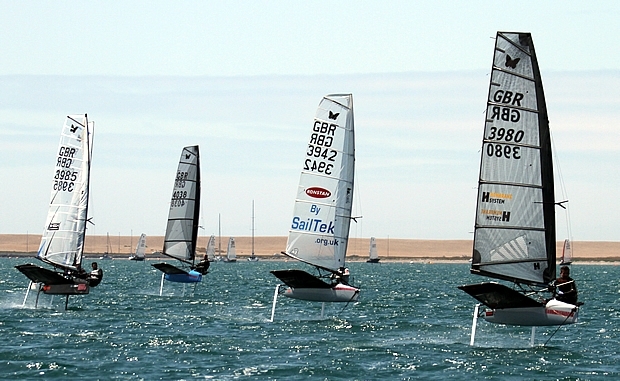 The fleet now look forward to Hayling Island open on 27 and 28 July, the venue of the 2014 Nationals and World Championship.